Next in the series on A&J South Florida Jerky is this "Fire Hot Habanero". Refer to last week's review of their Spicy Habanero, the earlier one of their Mild Habanero, or their Original. This Fire Hot Habanero is described by the company as being based on the same jerky as their Original flavor, but with four times the number of habanero chiles as thir Mild Habanero, and double then their Spicy Habanero. The first thing I taste from the surface of these pieces is a light sweet and light saltiness. With some sucking I can pick up a light habanero flavor, while a bit of heat starts building. The chewing flavor starts with a bit more saltiness and then some natural meat flavors come in. The soy sauce becomes lightly noticeable towards the latter part of chewing. For being labeled as "Fire Hot Habanero", it seems to hold up to that name. I'm picking up a good deal of heat, what I would rank on my hot scale as "medium hot" (level 4 out of 5). But I'm also getting more habanero flavor than compared to the company's Spicy Habanero and Mild Habanero varieties, enough to where a chile lover can enjoy it. Unlike with the company's other varieties, this one doesn't seem to have the dominant soy sauce flavor. I don't really pick up much of it until the latter part of chewing once some of the other flavorings have worn off. I'm sure this Fire Hot Habanero variety is still the same as the company's Original, just with lots of more habaneros, but maybe the extra habanero in this is cancelling out some of the soy sauce flavor? And nor can I pick up any of the ginger like I could with the other varieties. But what seems to come through better is the natural meat flavor. It's more easily noticeable than with the company's other varieties, but still not the dominant flavor. In fact, I can't really identify any single ingredient as having the more dominant flavor, it seems to be a trio of habanero chile flavor, natural meat flavor, and a saltiness combined. There's a of touch of sweet on the surface that lingers throughout, and then a light soy sauce that doesn't come through until the latter part of chewing. 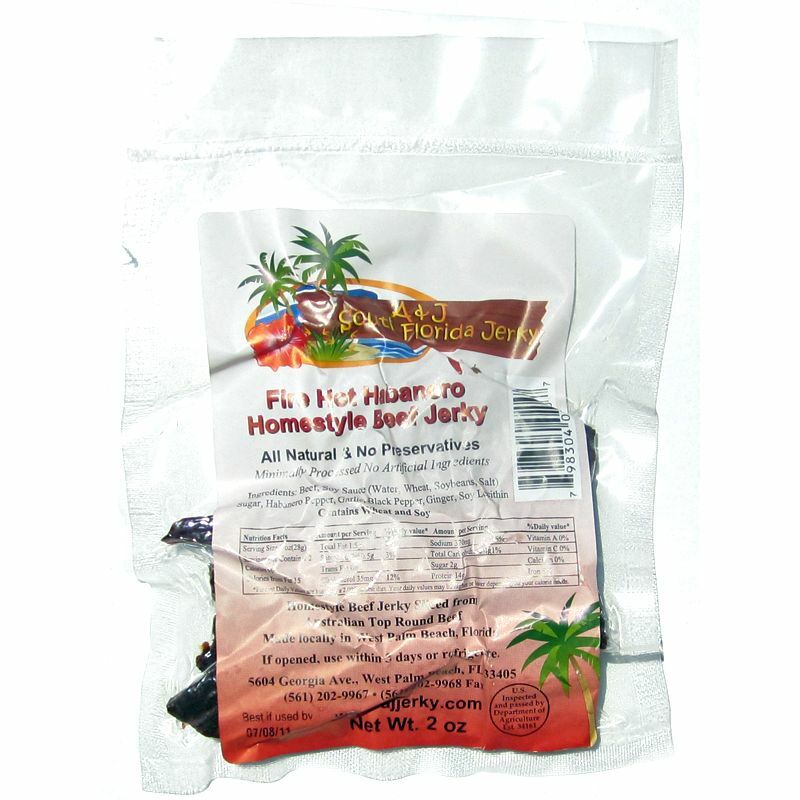 A&J South Florida Jerky sells this Fire Hot Habanero beef jerky from their website at a price of $4.50 for a 4oz package. If you bought four packages (sent to Southern California), they tack on sales tax of $1.17 plus $5.00 shipping, for a total of $24.17. That works out to $1.51 per ounce. 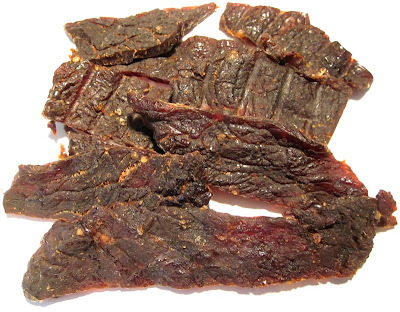 As a Fire Hot Habanero beef jerky, at the same $1.51 price per ounce, it's an excellent value. I'm getting a good deal of heat, and a decent amount of habanero flavor. Considering this jerky is priced lower than many other habanero jerky brands, it's well worth the buy. This Fire Hot Habanero variety from A&J South Florida Jerky dishes out a good deal of habanero heat with a decent amount of habanero chile flavor. 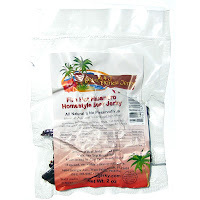 Considering the company claims this jerky is actually the same as their Original, but only with lots more habaneros, the habaneros seemed to have changed the flavor composition considerably. It's no longer dominated by a light soy sauce flavor, but now an even mix of habanero, natural meat flavor, and saltiness. The soy sauce doesn't become noticeable until the latter part of chewing, and the ginger flavor is even lighter yet. And because the natural meat flavors and the habanero flavors are stronger in this, I think this Fire Hot Habanero is A&J's best variety of the lot, with their Original being second. 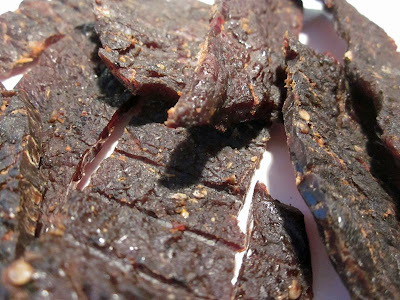 But the natural meat flavors still don't define this jerky. I'm looking for that "wow factor" to get this to the five-star level and it's usually a rich natural meat flavor or an awesome blend of seasonings and marinades that gets it there. This doesn't seem to have that. And I'm still not totally sold on the chewing texture. It does tend to have a steak-like chewing, but it's also a bit crumbly. I noticed that the first few chews can be somewhat brittle which seems to contribute to that. I bought a whole bunch of this online and he sent me some extra since it was an APO. The quality and taste were excellent, just as described here. I def would order it again!